UPDATE: We had another paper jam recently and it caused what seemed to be this same fault. Moving gear back to it's correct position solved problem. It may have started two days ago when our first piece of paper jambed. Note to self: when removing jammed paper, reassemble the pieces to see if you got it all out. It worked fine today, but tonight it started making horrid gear-grinding noises. Then I got the 'Ink System Failure' message. I tried a number of suggested remedies (see the 'fixyourownprinter' forum) but all they succeeded in doing was to factory default my printer - now I had to re-enter that very long wireless router SSID code again. After several power cycling events, I decided to investigate. I noticed how the ink pumps on the print head seemed to work - a black arm attached to a white gear is allowed to rotate about 1/2 a turn. The black arm is connected to a metal shaft which rocks a spring-steel sheet that depress some rubber boots. Like you might have on a lawn mower. The printer head can move all the way to the left. When it does, the gears engage with some other gears to drive this pump. In the picture you can see 2 white gears in the middle of the picture. The left one can rotate around the larger one and can rest in two possible positions. The position shown in the photo seems to be the correct position. The incorrect position is to the right of the larger gear. My little white gear was in the incorrect position so I moved it. Now my printer complained that I had a jam. And indeed, I still had a small piece of paper stuck in the area where the head parks itself. I removed it with chop-sticks and all was well. The printer cycled ink through the cartridges and was happy again. You just saved my printer. I had the exact same error code but did not see any paper jam. I looked in the corner you mentioned and saw a piece of paper stuck. Excellent. Thank you for taking the time to comment. I am loving you...we were ready to go out and buy a new printer. Never would've thought to look to the far right side. Thank you!!! YOU ROCK! Ditto to all the above comments, found the paper in the same place, fixed the little white gears and she's as good as new! Saved me from the new printer/repairs blues. Downside is now I have to get back to work :( I messed with the #*123 sequence and wouldn't recommend it. I reset the factory settings and it asked me for the starter cartridges again. Fortunately with luck I was able to retrace my step and correct the problem. Were also going to buy a new printer. Looked at the far right side and saw the other gears and the arm was not attached. I lifted the plastic arm up and attached it back to the top gear. Thank you!!! I have the similair failure and tried all the resets So I have to change the gears on the first picture and not the ones on the second picture? My English is not so well, please can you help me? Hi Jasper, The gear to move is on the left side of the printer. I don't think you can change any other gears. 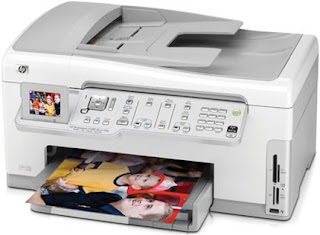 See if you can make your printer look the same as what you see in the pictures. Hi, thanks for the helpful information. Saved us from throwing the printer in the bin and purchasing a new one. Well done on such an informative site. Thanks very much! You just saved my printer.. Keep up the good work! Kudoz!!! On the print pop up screen it has stopped show the print 2 sides checkbox. Any ideas? Thanks again. I got a different code -- ending in 1281 -- and my little gear was in the wrong place but following your instructions didn't work! When I turned on the printer again it just made the grinding noises and moved the gear back to the wrong place! Any other ideas? My fault was caused, I suspect, by shredded paper in the system. Perhaps you have a similar cause? Add another printer saved from the electronics recycling truck. Grabbing the black arm (first picture) connected to the white gear and the white lever arm, I just pulled the ink pumps (your term for the slidey thing with the cable attached - I'll assume it pumps ink) toward the center of the printer - hard to access since the door doesn't open widely. There the paper was apparent - I did not see any paper jam in my initial survey - I should have reassembled the pieces and that would have told me to keep looking to paper left behind. Chopsticks are required! Problem solved. And thanks. I had the carriage stall and 0xc05d1281 error code. Took it to a local repair shop and was told I only had dry cartridges. New cartridges installed: the carriage still stalled. I snooped the web and finally found your blog. In my case, the small gear that was to be moved back was actually missing. (I paid a tech who missed that.) I spent an hour figuring out how to fish it out of the chassis and finally put it back on. After running the printhead cleaning program, everything is working fine. Hopefully this old printer will hold on another year or two. My gear is missing too. How did you fish it out? I am glad it helped. Thanks for your detailed reply. THANKS! I was getting the error code and was about to go out and buy a new printer with different ink cartridges. When I looked at your picture of the gears on the left, I saw that I was missing the small gear. After some dis-assembly, I found the small plastic gear and put it back on (took a few dropping of the gear and fishing it out again). It works again! Any ideas why the gear can fall off? I don't know why the gear fell off. The thing that holds the gear is not broken, so it retains the gear when I push it back on. The printer works fine now so I don't know how the gear came off in the first place. Very strange. Thanks again for your pictures. Phil, you are the BEST. Spot on...exact same problem, solution worked 1st time. Thanks for the pictures. THANK YOU!!!! Thank you Ed for commenting. You are awesome......thought I got the entire sheet of paper, but I missed a piece. Same location as yours, and just as wrinkled. Wouldnt have figured it out if it wasnt for you. Thank you SO MUCH!!!!!! Had the 0xc05d1281 error, found the small white gear wheel had popped off and was deep inside the printer. Like others, it took several attempts to get the gear wheel back onto the black spindle. But it finally seated properly, and on power up the printer cycled through a cleaning/priming sequence and now works (4 days so far). Saved from the junk bin! Helpful tools were chopsticks for reaching, two different sizes of needle nose pliers, and a flashlight to fish around on the inside to find the lost gear wheel. The problem today is that allot of electronics are manufactured with substandard electrolytic capacitors and over time they go bad. Well this is what i found with the logic board of my hp c7280 printer. Be careful when removing capacitors because the boards on most things now a days are multi-layered boards and you have to make sure you have all the solder removed before pulling it out of the hole or you might pull the pad out with it. But I would bet that if most of you checked your logic board you would find some puffed caps on the board. On mine i located one puffed cap and replaced it and it seems to be working fine. No errors No Problems. You can probably buy the caps you need on eBay. The bad caps where causing a delay in the timing for the printer heads and the gears causing them to slam into each other or make the gears not line up correctly and causing them to grind together. Well I hope this helps. These sort of capacitor problems are usually in power supply circuits and by not working properly, voltage lines can be so noisy that devices will crash. I am looking for a solution to Ink System Failure Error: 0xc05d1381 Has anyone found a solution to this yet? This blog post is how i fixed this problem. What have you tried? I looked at the little gear you talked about. It was to the right, I moved it back to the left, but it keeps moving to the right. I also get the clicking sound,probably due to gear being in wrong position. Perhaps, like me, you have some paper or some other foreign object causing this fault to reoccur? You saved another printer. I was also getting this code and tried the 123 code fix and it did absolutely nothing. I had a paper jam about a week ago. I looked inside for any small pieces of paper and didn't see anything. The paper had absorbed alot of ink and was dark colored and I couldn't see it without a flashlight. After reading your post, I got a flashlight and looked inside and it was right where you said it would be. I took it out and restarted the printer. It started up and worked like a dream. I am so happy. I love the work that this printer does and don't want to spend the money for a new one. Hello ! Thanks for your post first. I'm trying to fix the same model, i get that grinding noise on startup when it tries to pump of clean the cartridges. I've tried removing the left panel and keeping the top cover switch closed, after resetting the hardware failure status and trying to print. Any ideas would be very very welcome, thanks !! Phil, I went through many postings and yours is the champ! I also tried all of the resets like many other people for my error code 0xc05d1281 and nothing worked. So I started to look inside the printer and found the small white gear missing. It was laying in the bottom of the printer. I replaced it, placed it in the correct position as per your instructions and the printer when through its preparation properly. It is printing great and saved me buying another new printer! Thanks to the internet and people like you, Phil! That's great. Thanks for commenting. How so you get the printer head to move from the right side of the printer? Mine seems to be stuck to the right while the printer is idle. My code was 0xc19a0035 and my gears were in the wrong position so, I fixed that...THANK YOU! : ) I just can't see on the right side whether or not I have paper stuck in there. Can you help? Continuing above comment. My printer still prints but the code 0xc19a0035 keeps coming back and I have to shut the printer off and on. I can't help since I don't have your problem. Thanks. This was great info. I opened the printer and found the small gear that fell off its spindle. You saved me a couple hundred dollars in purchasing a new computer. Thanks again. You are most welcome! Thanks for taking your time to let me know. Since I did the repair i posted on October 15th 2011 have have not had any problems since. gear stays in place,d no more error codes, and no more grinding sounds. Thought i would post an update. Thanks for your update. It has been 2 years since I posted this and my printer too, has been running without problems. I have also installed a continuous inking system that is just great. How simple can it be. There it was a little black split shaft starring me right in the eye. shook the printer until it fell out, and installed it. Just like new. Thank you very much. It's wonderful to have people like you to rely on. Thanks also for the no-cost professional help,very few and far between now a days. You have a legacy. Exact same problem here, tried anything and was about to toss the damn thing to the recycling bin. Saved me a new printer. Phil - thanks for the post. I had same symptoms without the offending piece of paper and without resetting factory defaults. My machine looked just like you showed. So I reversed both sides. Push small cog on left to back of machine. Rotated the large cog on right hand side (using a finger nail) so that the cantilever moved toward the bottom of the machine. Restarted the machine to hear the whirring sound of the pump and voila printing. THANK YOU!!! It seems like moving the gear saved me from buying a new printer. Perfect. After hours of restarting, replacing cartridges, pushing buttons, realigning, etc etc, I took this advice and found, yes, 7 little scraps of paper in the far righthand back of the printer's internal parts, some of them apparently dating back to the pre-jurasic age....cleared them all out and now....working again! Many thanks. Do I go in there through the back of the machine? Is there something I have to remove besides the cover on the back that snaps on and off? Thanks. Sorry to be dense, but how do you get to the place where the gears are? Never mind about my last post, thank you. I found the gears. Now all I need is midget hands to get down in there and replace the gear that had fallen off, just as you said, lying there on the bottom. Any hints? i used the reset trick and now i am stuck with it saying "wrong cartridges. Use the introductory cartridges that were shipped with your printer." It wont respnod at all. Any ideas? I would like to look for paper jam but head wont move. At a risk of doing more damage, I would try harder to move head. What do you have to loose? Stated it had paper jam and ink failure problems. Tried all the reset stuff, but no good result. I had previously fixed my other printer twice with this fix. Then I found your blog and on examining your pic noticed I only had one white gear in place. I found the other little blighter inside. My question is: Is there an easy wy to replace this gear on its spindle. Hands too big. Is there an easy way of accessing the printer that you know off? Well put together. My gear had not come off so I have not had to do this. At least one other seemed to have just pressed it back on. What about double sided tape to stick gear to your finger? my little gear is underneath and to the back of the larger one. ive tried moving it up and it will not budge.. can someone tell me how to do this please!! I have replaced my HP2780 with a Brother A3 printer, swearing never to buy HP again, having been driven mad by the need to reset the hp printer after each ink failure message. The machine has been switched off for a month, as I use the Brother. Saw your blog so replugged and rptated the cogs and levers on the ink pump. The message that sent me to Brother was "Ink pump failure" The hp7280 now works fine, at least today. Does anyone have a feel for the expected life in years or pages printed that the machine can be expected to last for? Bought my 7280 May 2008. Page count is 9,677.